I am so excited to share this review by Open Letters Monthly managing editor, Steve Donoghue, that I'm just going to post the whole thing here, to save you that one extra click. Afterwards, if you just can't get enough of me (I know I can't), click here for an interview Mr. Donoghue asked me to do for OLM. Ignorance and superstition have far more allies in this world than open-mindedness and tolerance. Greatness, I have observed, is a highly overrated commodity, to be shunned with the zeal of the devout. Seek rather the halcyon shadow of anonymity if you desire a happy, contemplative life. Such insight comes late to Alexandros himself. For the last thirty years, he’s been the slave and agent of the famous Roman plutocrat and triumvir Marcus Crassus, trusted by his famously wealthy master on many missions large and small, as Levkoff has chronicled in the first two books in the series, The Other Alexander (2011) and A Mixture of Madness (2012). Wealth and notoriety have come to Alexandros almost by osmosis, and although he might desire a happy, contemplative life (Levkoff leaves open the possibility that he’s every bit as hungry for fame as his master), it’s further out of reach with each successive volume. Indeed, the conclusion of A Mixture of Madness seems to leave all futures out of reach for Alexandros. Having been caught by Crassus trying to conduct a covert negotiation to head off the war Crassus is fomenting in the Roman East, Alexandros is crucified on the banks of the Euphrates by his former master and left to die. Alexandros comes off his cross more dead than alive, rescued at the last minute by two renegades from the huge Parthian army then massing in Syria in anticipation of a Roman invasion. One of those renegades, a champion archer named Melyaket, strikes Alexandros as “brushed by something extraordinary” (“and generally speaking, whenever that happens in this life, no good can come of it"), and it’s Melyaket who at first spirits Alexandros deeper into the interior of Parthia, away from the eight Roman legions of Crassus – and also away from Livia, a medicus with the legions, Alexandros’ wife and the mother of his baby son Felix. Alexandros, who otherwise characterizes himself as “a steadfast advocate of the power of the inertia of circumstance,” wants to tempt his own incredible good luck surviving Roman crucifixion by returning to the power of Rome in search of his beloved – a course of action at first made impossible by the fact that Melyaket is himself being hunted, by a smooth-talking one-eyed Parthian general named Scolotes. From these elements Levkoff fashions a smart and gripping narrative as Alexandros’s travels in Parthia teach him a great deal about Rome’s inveterate enemy, the polyglot kingdom Marcus Crassus, inflamed with ambition, hopes to conquer, undaunted by that kingdom’s size, or wealth, or rumored ferocity in battle. “The more skilled the opponent,” he insists, “the greater the glory when he is vanquished. And glory is the chief prize with which I must return to Rome.” That this glory is beyond the reach of a man commanding seven Roman legions never occurs to Crassus (“There is no nation of Parthia,” one character says, voicing a common sentiment; “there are only ten thousand villages who pay taxes to [Parthian King] Orodes. Ask any herdsman or farmer what country they live in and they will scratch their heads"), who’s busily preparing his war with his son Publius as his chief lieutenant and his wife Tertulla worrying on the sidelines. Even a beginning student of Roman history will know at the outset of Blood of Eagles how incredibly wrong such thinking is. Crassus, so spurred by a hunger for military glory that he undertakes his Parthian adventure without the approval of the Senate back in Rome, will lead his eight legions and thousands of auxiliary forces in a grueling march across rebellious territory and open deserts in order to strike at the ranks of the Parthian king, ignoring both local offers of a shorter route and warnings that the Parthians have developed a fighting force called cataphracts: heavily-armored men on heavily-armored horses – essentially, medieval mounted knights ten centuries early. In the spring of 53 BC, sixty-one-year-old Crassus thus led his forces into unknown territory against a misjudged enemy. The Roman tactical intelligence had long since been suborned by Parthian bribes, and the Parthian strategy – alternating between cataphracts and an endless, punishing stream of arrow-fire – decimated the forces of Crassus while suffering virtually no casualties in return. The fight, very nearly a massacre, took place near the town of Carrhae, and Carrhae has entered history as one of the worst defeats in Roman history. Over 30,000 Romans were killed or captured. 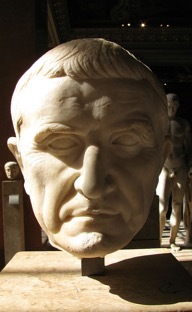 Young Publius Crassus’s head was cut off during the battle and mounted on a spear for his father to see, and Crassus the elder was killed in a melee that resulted when tense truce negotiations broke down. The story that the head of Crassus was later used as a prop in the Bacchae of Euripides for the amusement of the watching Orodes is just macabre enough to be true. … as a doctor she should have known that the eyes are only the last stop on the journey of tears. Great sobs welled up from inside her like whales breaching. Grief, a curling breaker, swept her up, then took her breath as it threw her down. She gasped for air, aware of nothing save her own wretchedness. After a time, she felt arms around her – a cradle for the infant she had become. “Power rests with one in a thousand men,” Alexandros observes. “The rest of us either live in fear of brushing up against those who have it or of losing the tiny bit of it we have convinced ourselves we possess.” As a slave when Levkoff’s series starts off, Alexandros could have very little expectation of possessing power except that reflected from his famous master. And yet by the time we meet him in the pages of Blood of Eagles, he’s a seasoned wielder of power himself, as short-tempered and thoroughly disillusioned as Crassus himself, with one key difference: he’s experienced first-hand the vicious turns Fortune can take, and it’s given him a respect for disaster Crassus doesn’t share. The passages in which Levkoff shows the intelligent, calculating calm with which Crassus marches to his doom are wrenchingly ironic, and Levkoff repays the rich man’s hubris by adding a sadistic but very believable twist to the legend that once the Parthians had killed Crassus, they poured molten gold down his throat in order to mock his legendary greed. The first “Bow of Heaven” book, The Other Alexander, is very much composed in a key of humor, but by the events of Blood of Eagles, the tone has come to tragedy at last. So he keeps saying. But readers of “The Bow of Heaven” trilogy know otherwise, and newcomers will be glad he’s wrong. 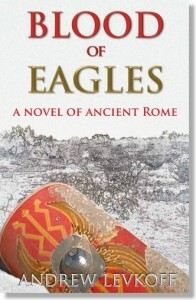 This series has the careful research and traditional pacing of Steven Saylor’s best Roman historical novels, as multifaceted a portrayal of Roman slavery as anything found in historians like R. H. Barrow or K. R. Bradley, and, in Levkoff’s Marcus Crassus, as convincingly multi-faceted a fictional portrayal of a Roman titan as we’ve had since Thornton Wilder’s Julius Caesar nearly 70 years ago. Blood of Eagles squarely faces the blunt tragedy of Crassus’s death – and the surprising multiplicity of the land and people that killed him. Steve Donoghue is a writer and reader living in Boston with his dogs. He’s recently reviewed books for The Washington Post, The National, The Wall Street Journal, The Boston Globe, Historical Novel Review Online, and The Quarterly Conversation. He is the Managing Editor of Open Letters Monthly, and hosts one of its blogs, Stevereads.